Green bean and tarragon salad goes great with some toasted bread, perfect meal for a hot summer evening. And it's vegetarian! FILL the medium-sized pan with water and a pinch of salt and bring to a boil. TRIM the edges of the green beans and cut them in half. The most easy way is to use your hands or knife to line the beans up at your cutting board, about 6 at a time. Cut one side off first and then the other side. When the water has come to a boil, cook the beans for a few minutes. Immediately remove from the water and place under running cold water to stop them from becoming overcooked. PEEL the red onion and slice into half rings. RINSE the ripe tomatoes and cut into quarters. CUT half a lettuce into smaller pieces. REMOVE the tarragon from the stems and mix with the lettuce. 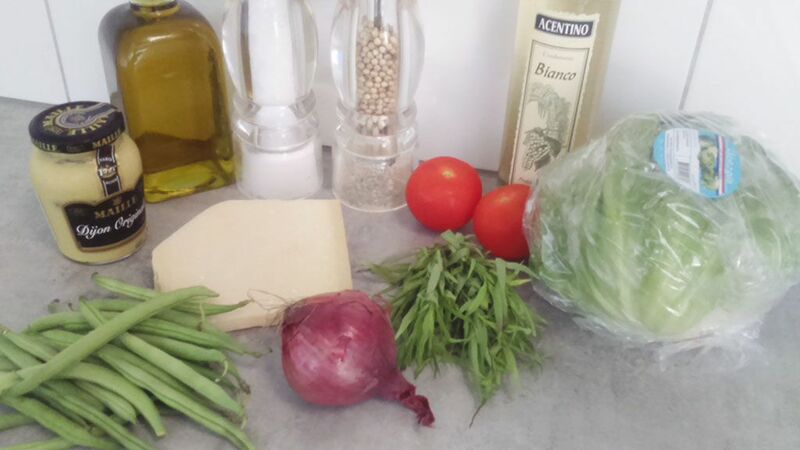 Now create a simple vinaigrette. COMBINE Dijon mustard and white wine vinegar in the small bowl. Slowly add the olive oil and use your whisk to mix it well. Season the simple vinaigrette with some pepper and salt. 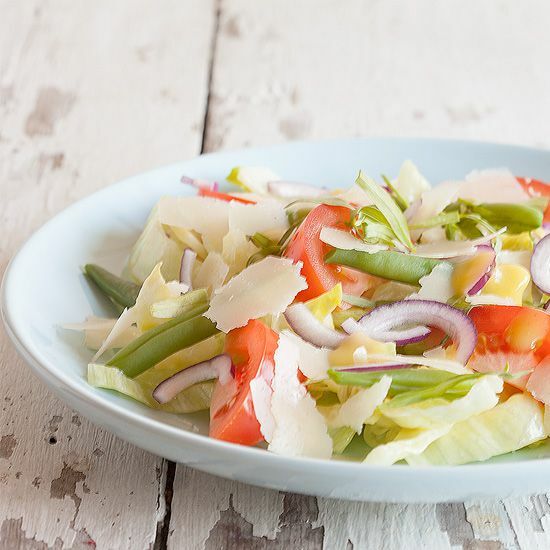 DIVIDE lettuce, tarragon, tomato quarters, red onion halves and green beans on 2 plates. 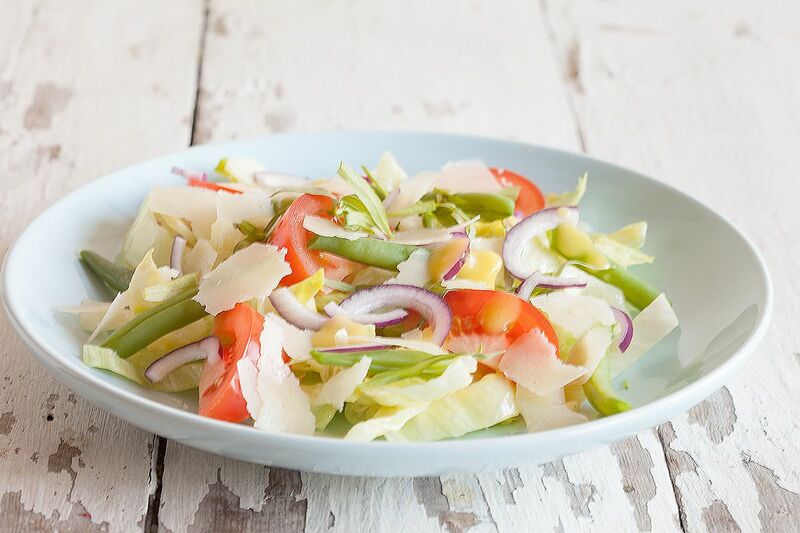 DRIZZLE with the vinaigrette and use a vegetable peeler to create Parmesan cheese shavings to finish this amazing, yet simple, salad. 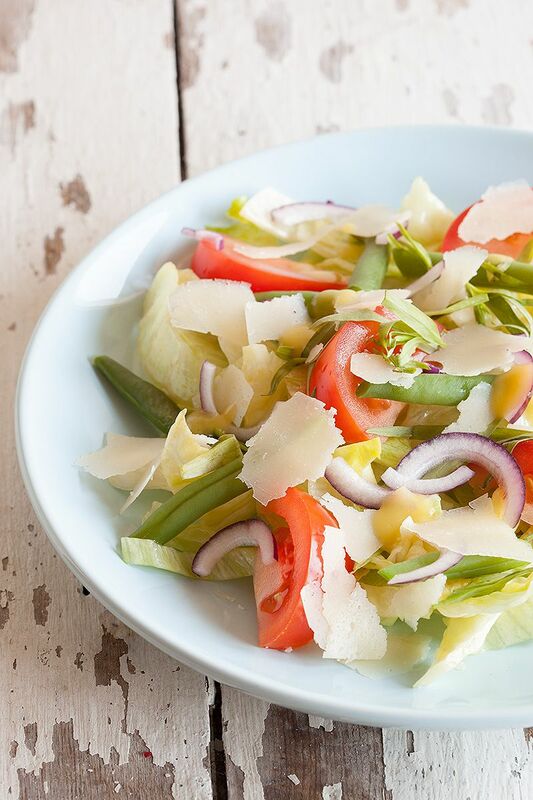 We ate this salad with some toasted bread, very good weekday meal. Enjoy!